I saw the story in the Vancouver Sun this morning and thought about blogging it. It quite an extra-ordinary event. The Premier has decided to “write off” a gas fired power station to encourage generation of cleaner electricity and an environmental group publishes a press release deploring it. The press release is copied untouched below. Burrard Thermal was not used very much but it did provide a standby. Not that firing up a thermal station, which uses gas to raise steam which then drives turbines, is all that fast. Not as fast as “turning on the tap” at a dam – or lighting a jet engine, which is what a gas turbine is and which are used around the world for their efficiency and fast response. Proposals to replace the steam turbines with gas turbines at Burrard never went very far. Despite being one of the bigger polluters in the region, the air downwind of the chimneys was actually cleaner than upwind, thanks to the NOx paradox. The station was originally connected to the oil refinery – which closed years ago. It reflected a time when power stations were sited close to the users to reduce transmission losses. That no longer applies either. The politics of power in BC are complex – and so are the issues around Burrard Thermal. And it really has nothing to do with the environment – but a lot to do with spin and optics and who your friends are and what you think is really important – making money or saving the place we live in to make it inhabitable for the future. So now I am going to turn this over to Ben West. Vancouver, BC – The Wilderness Committee today condemned the BC government’s decision to order BC Hydro to buy an additional 6,000 gigawatt hours of electrical power from private power producers, in direct opposition to what the BC Utilities Commission (BCUC) has recommended. “Requiring BC Hydro to purchase power that it doesn’t need is an idiotic decision and a gift to the private power industry. Three months ago, the BCUC said buying this power was not in the public interest, and yet the BC government is ignoring their own regulatory watchdog and ordering BC Hydro to spend billions of dollars on power we don’t need. This decision won’t reduce greenhouse gas emissions in BC by one iota, but it will damage a lot of streams and rivers in the process,” said Gwen Barlee, policy director with the Wilderness Committee. “Private power coming from so-called ‘run of river’ projects comes mostly at the wrong time of year for British Columbians, is costing us far above market rates, and threatens our rivers and streams. Ratepayers are already on the hook for $31 billion in energy agreements to the likes of General Electric. The BC government’s decision to order Hydro to buy even more of this power is irrational and unacceptable,” said Wilderness Committee campaign director Joe Foy. The BC government justified the decision to purchase more expensive private power by over-ruling the BCUC and reducing the “planning” capacity of Burrard Thermal, a gas-powered plant in Port Moody. Since 2002, Burrard Thermal has run at about five per cent of capacity, being used almost exclusively to provide firm emergency peak power backup in winter months. Ironically, Burrard Thermal will continue to operate in the same manner it has for the last seven years despite the government’s recent announcement. The BC government has come under intense criticism since the introduction of the BC Energy Plan in 2002 which prohibited BC Hydro from producing new sources of hydroelectricity. The Energy Plan resulted in a gold rush which has seen over 800 water bodies, including lakes, staked by private power corporations. Private hydro projects have been heavily criticized for low environmental standards, lack of public input, and a lack of provincial or regional planning process. “It is sadly ironic that while the BC government is bailing out the private power industry under the ruse of addressing climate change it is blasting ahead with contradictory plans to promote carbon-producing coal mines such as Klappan and Groundhog in northern BC, axing Live Smart BC, radically increasing subsidies to the oil and gas sector, and promoting massive highway expansion. People recognize hypocrisy when they see it and are aware that this gift to the private power sector has nothing to do with addressing global warming,” said Barlee. The Wilderness Committee is Canada’s largest membership-based, citizen-funded wilderness preservation organization. We work for the preservation of Canadian and international wilderness through research and grassroots education. The Wilderness Committee works on the ground to achieve ecologically sustainable communities. We work only through lawful means. Thank you for supporting wilderness. The E&N Rail Dayliner could soon be turned around — starting up-Island in the morning and heading south from Nanaimo into Victoria for its first run of the day instead of the other way around. Bruce said the change could take place as early as six months from now. 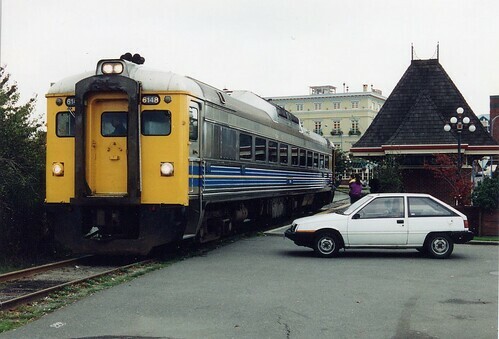 Currently, one 90-passenger car leaves Victoria each morning and travels to Courtenay before making a return trip at the end of the day. Islanders have complained for years that the train is going the wrong way and missing potential commuter traffic. I will believe it when I see it. VIA Rail has known that this service was needed for at least the last twenty years – and probably a lot longer than that. I have never understood why they have persisted in refusing to run trains when people actually might want to use them. But then VIA rail is even more shambolic than Amtrak. The idea would be to operate two trains out of Nanaimo. The first might leave at 6 a.m. for the capital region, then turn around for its trip to Courtenay. A second train could leave Nanaimo shortly after that, carrying another load of people to the capital region, and then operate back and forth between Victoria’s downtown and Langford over the course of the day before heading back to Nanaimo. Both Backhouse and Bruce say there is potential for excursion rail as well, with one run possibly linking up with a new cruise-ship terminal in Nanaimo and taking people to Cameron Lake. The bad news is in the tail. There is also a proposal to open up a new coal mine near Union Bay which, if it ships coal for export could bring significant new rail traffic. That might be good for the railway but it is not at all good for continued human survival on this planet. It is not clear but the way the story is currently put together suggests the coal might cross subsidize the passenger service. This seems somewhat more likely than government actually directing VIA to behave in the public interest. Mike Harcourt published this opinion piece in the Vancouver Sun on October 22nd, before the Mayor’s vote to fund only current services not expansion. Oddly, that was not picked up by the Google News Alert that I use on a daily basis to track new stories with the phrase “Metro Vancouver” in them until today. Of course, Martin Crilly, the transportation commissioner, had already told the Mayors that they could not legally authorize spending on expansion as they have no permitted additional revenue sources available to them. So there was really very little point in Harcourt hectoring them. He should have been addressing the provincial government, which has placed Translink in a financial straight jacket. Their freedom of movement is tightly constrained – as I explained at the time. As well, over the next 10 to 20 years we have a number of old bridges and approach roads we will need to replace. 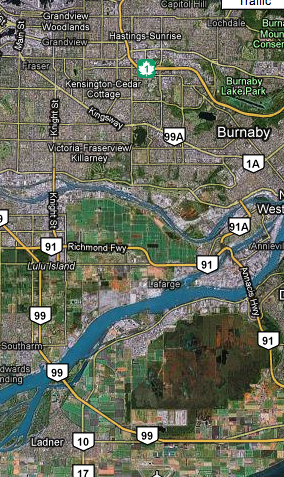 The Port Mann and Pattullo Bridges you know about. But what about the 50-to-80-year-old Queensborough, Knight, Oak and Lions Gate Bridges, as well as an expanded Massey Tunnel? Only the Patullo and Knight Street bridges are Translink’s responsibility. All the others belong to the MoT. And, as noted here recently, the MoT has discounted any expansion of the Massey Tunnel. The province has shown, however, that its policy for not tolling existing infrastructure does not apply to replacement structures. The new Port Mann bridge will be tolled. Translink will be allowed to toll the Patullo since Kevin Falcon stated that the Alex Fraser is an adequate free alternate to the tolled Port Mann. So if these bridges need to be replaced soon expect tolls on many of them: Oak Street is easy since there is the Arthur Laing as a free alternate. Tolls were rejected for the Lion’s Gate upgrade – and I would have expected that to last for more than 20 years. Maybe Harcourt has some insider information I have not seen. Missing from Harcourt’s list but arguably much more significant to him – as he is a director of the Vancouver Port Authority – is the New Westminster Swing Bridge – the only railway crossing of the main arm of the Fraser in the region. This critical link is used by BNSF, CN, CP, Amtrak and SRY on a daily basis. It is single track and older than any of the bridges identified by Harcourt. It is the most significant bottle neck in the region and a major restraint on rail service expansion of any kind. Its replacement has been necessary for many years now – and, so far as I know, nothing is being done about it. He is of course right to address both provincial and federal governments. He is also right to identify the need to create a sustainable region. Perhaps what is remarkable is, apart from a reference to “Metro Vancouver’s economic competitiveness” there is no direct reference to Gateway. That project is the one that is sucking up all the available resources for transportation in the region – from both federal and provincial sources – and is the least sustainable of all the options. It has no transit component (merely a few airy “promises” for later consideration) and will ensure that the region south of the Fraser will be unsustainable for the next 40 years at least. We could have a sustainable region within that time if the billions of dollars devoted to building and expanding freeways were spent on transit instead. Indeed, with sensible choices, that might even leave some money to be spent on replacing the odd ancient bridge too. But what we are seeing now is the end of any hope for a sustainable region. By the way, while we are talking about the need to replace aging infrastructure the same paper has this piece about Metro’s need for much more money for water, solid waste and sewers. And that will come from property tax. A 50% increase over the next five years. So you can see why the Mayors could not vote for a property tax increase for transit as well. 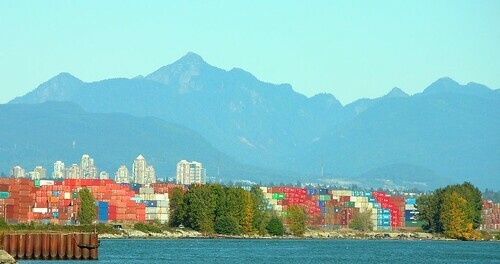 This post is really just to let you know I have updated my recent post on Gregor Robertson’s “Greenest City” plan. Ned Jacobs has written a trenchant opinion column for the Georgia Straight which draws the links between Vision and the people who pay Vision’s bills – the developers. He also traces the recent decision making processes which seem to show that what Vision say they want and what they actually do are some distance apart. Laura Stone in the Vancouver Sun on two reports from the Vanier Institute of the Family. The Sun of course does not provide a link to either of the reports or the institute so I have saved you the Google search. Neither, it seems to me, says anything very new or surprising. “We have built cities that actively discourage walking and biking among children, certainly when we compare the experiences of today’s children and those of their parents,” writes Juan Torres, an urban planner and professor at the University of Montreal, in his study titled Children & Cities: Planning to Grow Together. It also actively discourages walking and biking in the population as whole. We have known for a long time that this has had serious health effects – but I understand that Larry Frank is doing even more research on that. Obesity, type 2 diabetes and heart disease are all directly caused by lack of physical activity and are strongly correlated to suburbs. I took the picture below yesterday when I went for a walk to post a letter. This is not within one of the dendritic pattern subdivisions but on a main artery – No 4 Road. 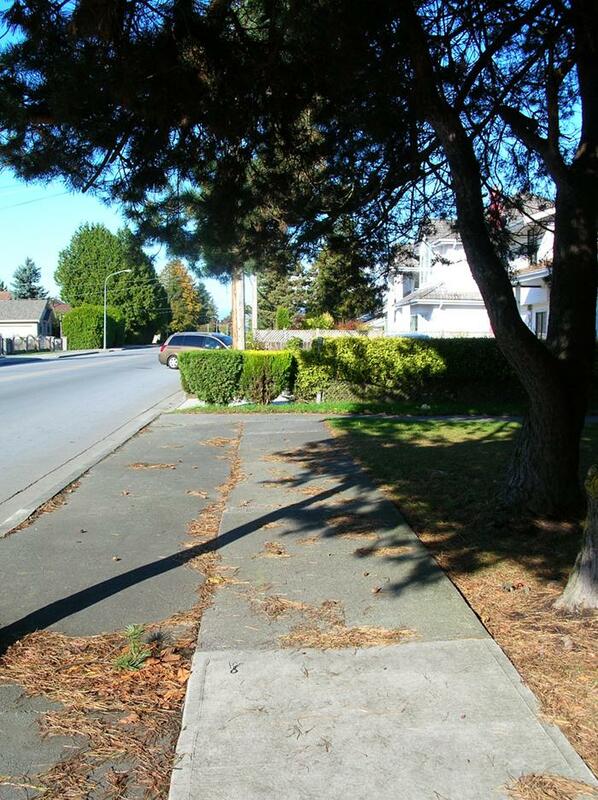 There is a sidewalk on the other side of the road – but no crosswalk. You are expected to go back to Steveston Highway, cross at the lights and then retrace your steps. I, of course, jaywalk. Which is one reason why we worry about our children. Do as I say not as I do. Crossing the street is taking your life in your hands. A second report, Caution! Kids at Play?, written by psychology student Belinda Boekhoven from Carleton University in Ottawa, finds that a decline in unstructured playtime and outdoor space in cities, also related to urbanization, can affect a child’s self-motivation and self-reliance. The report is essentially a summary of lots of other studies. It does not, it seems to me, deal with why parents now feel they must supervise their children’s activities at every step – or have some responsible adult do it for them. Partly it is the very realistic fear that children are at risk when walking and cycling of being struck by moving motor vehicles. What I heard at work when this issue was discussed was that while this factor is the statistically significant one, the one that is still high in parents’ minds is “stranger danger” or the “Michael Dunahee effect”. Child abductions by strangers are very rare events but they are also very prominent in media reports. It is a fear that is also successfully exploited by Hollywood. Taken together, the lack of safe pedestrian paths, the dispersed distribution of all facilities due to land use policies and the real and, possibly exaggerated, fears of parents are the real threats to children. A study published in the October 2009 ITE Journal reports on survey results in Hillsborough County, Florida among both parents and children on factors that prevent walking or biking to school. “Violence or crime” was reported as a factor by 42% of parents but only 5% of children. The question is not so much what do we do about this – after all, as I said at the top, none of this is news and safe routes to school and walking school buses and all the rest have been around for years. The real question is what does it take for us to do something really effective about all of this and bring about real change. I can see why the seemingly remote possibilities of climate change disaster seem less pressing than the “need” to stimulate economic growth. But when it is our own children that are threatened, why is it that these problems continue and are not effectively addressed? Thanks to regular reader and sometimes commenter Richard Campbell I am now aware of the blog of a mother who is trying to tackle this issue. Its called “Free Range Kids”. She was labelled “America’s worst Mom” because she allowed her 9 year old son to ride the subway on his own. Incidentally if you want to know what a day in the life of a transportation planner doing pedestrian studies looks like, head on over to the Unemployment Roadshow. The Middle Arm of the Fraser will get millions of dollars in additional flood protection now that the green light has been given to a series of major dyke infrastructure upgrades in the city. 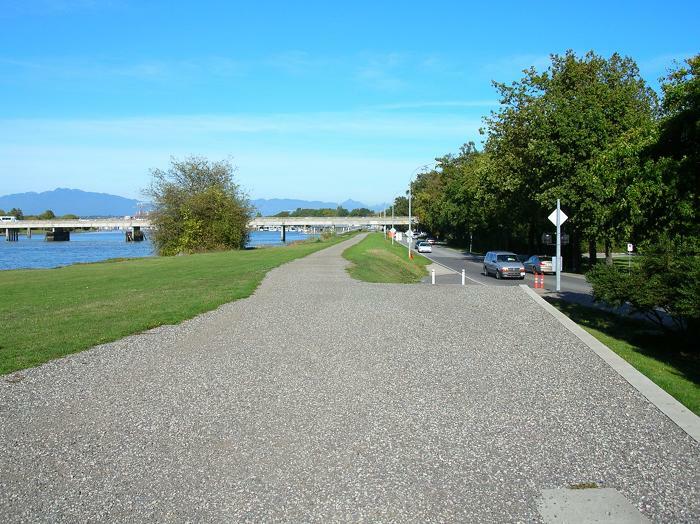 $2.4 million will be spent on bolstering more than 750 metres of dyke between Cambie Road and Hollybridge Way. Plans call for the dyke top be raised about half a metre, concrete floodwall retaining structures will be added, and rip-rap armouring will reinforce the river face of the dyke. Some $4.8 million in funding – from the city, province and Ottawa – will be spent on upgrades to the No 4 Road drainage pump station. This is a small sum for a small raise to a small percentage of the dyke. The rip rap is needed to reduce the impact of wash from passing vessels. The pump station is not on Middle Arm and is some distance from the area of dyke raising, so is really a separate project. Pumps get rid of water from behind the dyke.